I'm squeezing in one final Christmas recipe for the year, one of my favourite treats - madeleines. 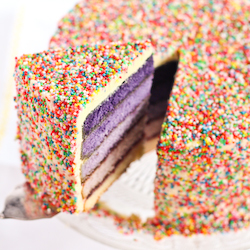 Delicious little shell shaped sponge cakes that are somewhere between a cake and a cookie. I honestly adore them, and I decided to Christmas them up. I know I posted my pandan madeleine recipe a while back, but I wanted to see if I could take out some of the more tiresome steps of the recipe and still get the same results. And it turns out my new simpler recipe is just as good. 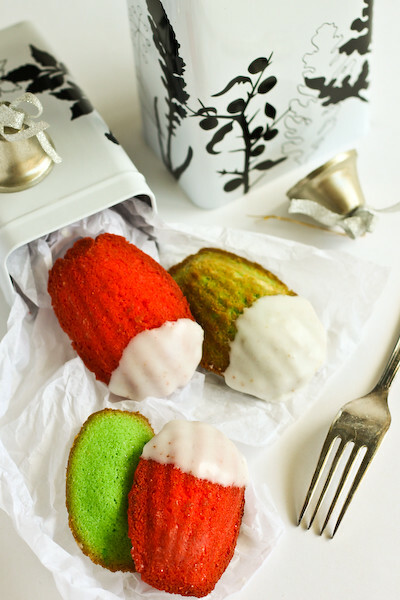 So here are my Green (pandan) & Red (strawberry) Christmas Madeleines. I am still a little traumatised from my last experience with madeleines. So many batches of flat, sticky fail madeleines will do that to you. It was a little scary trying again, but I think I finally figured out why my last experience led to so many madeleines without their signature humps. I found that my batter was more likely to collapse and not develop a bump if there were fairly large air bubbles in the mixture, which seemed to weaken the batter and cause it to deflate in the oven. 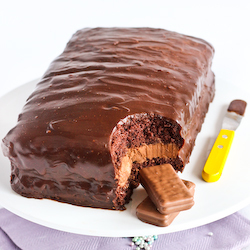 So if you're having any trouble with your batter, make sure you give it a good stir to get rid of the big air bubbles! 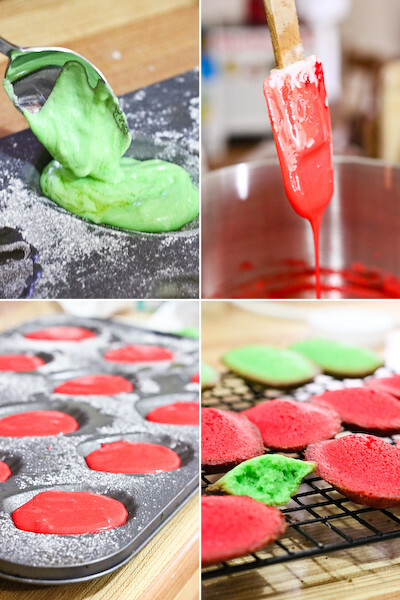 The issue kind of reminded of what you need to do when of mixing up macaron batter. Like any madeleines, these are best eaten straight out of the oven. I dipped them in a thin layer of plain white icing, because I think that makes them extra Christmassy, but it doesn't really need them. I love the vibrant colour of the red ones (thanks to my tub of Wilton colouring paste), but I can't go past the fabulously fragrant flavour of the green pandan madeleines. So good that it will be hard for you to stop at one and exactly the type of thing you'd expect to be indulging in on Christmas day. Preheat oven to 180 degrees C. Grease madeleine tin very well, then dust lightly with flour. This will make it easier to remove the madeleines later. 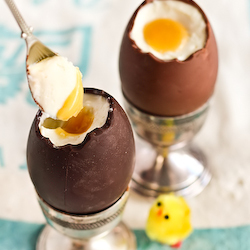 Combine eggs and sugar in a mixing bowl and beat with an electric mixer until the mixture is very pale and fluffy and has tripled in volume, at least 6 minutes. Add sift flour and carefully fold into mixture. Finally, stir in the melted butter until just combined. Split mixture into two separate bowls. Stir in pandan flavouring to taste (I used about 1 tsp) into one bowl, and strawberry flavouring (about 1/2 tsp) + red food colouring into the other bowl. Carefully spoon pandan mixture into the moulds filling them about 3/4 full (a bit less than a tablespoon). Bake for 10 minutes or until the tops of the cakes are just turning golden. Immediately and carefully remove the madeleines from the tin and cool on a wire rack. Regrease and flour tin and fill with strawberry mixture and repeat. When madeleines are cool, mix icing sugar and milk together in a bowl to form a paste. dip icing on the end of each madeleine, then leave on a wire rack to set. Best served freshly baked, can be stored in an airtight container for a day or so. 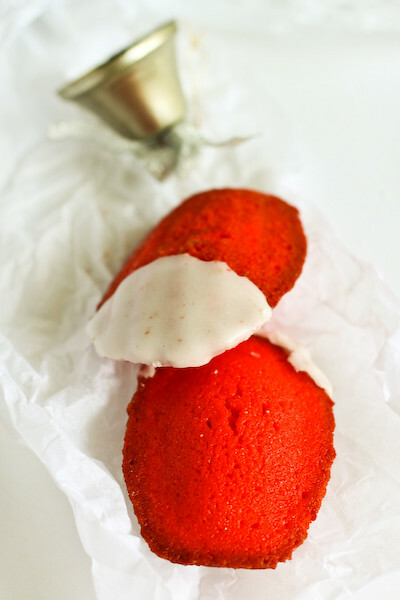 The red madeleines are like a delicious Santa :) Have a happy Christmas, Steph! These look lovely! ... and very Christmassy. Hope you're getting ready for Christmas! You know, these would look so cool hanging on a Christmas tree (I wonder how I can do that?!) - but surely they wouldn't last that long since they look so yummy! Happy Holidays Steph. What sweet little cookies! 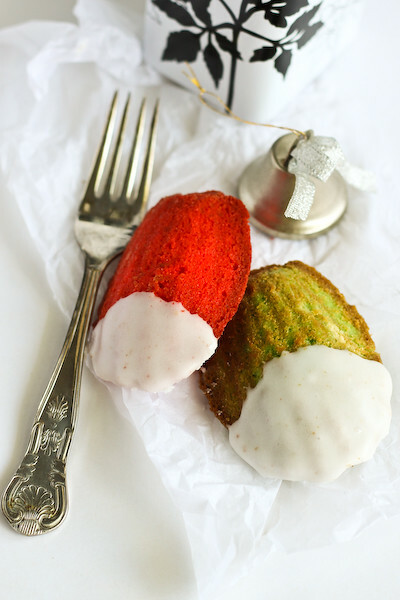 I'll take madeleines any way I can, but Christmas colored -- sign me up. ooh those are sooo beautiful! this is my first time on your blog it's amazing! 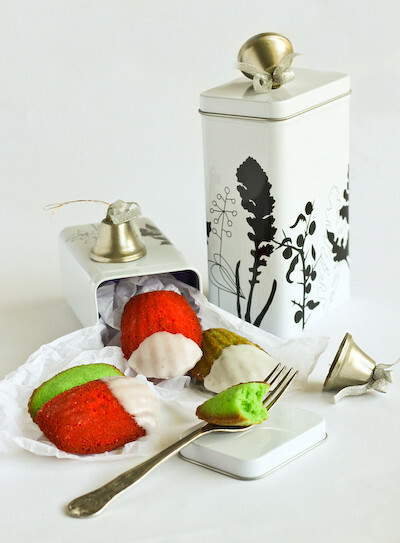 following you now :) really lovely madeleines, hope you have a happy holiday too. How lovely! I love the festive colours. 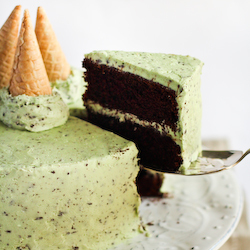 Dipping them in tea would be so fun. Beautiful! I think if you left some of these out for Santa you would be given all the Kitchen Aids in the world. And a shiny new bike. Absolutely beautiful! Will now have to search for pandan paste. Your madeleines are absolutely stunning! Love the holiday colors! so bright so vivid! also, i really love those bells! merry xmas dude! Hello,I am so glad that I got to know about your blog from Rasa Malaysia. I have a little thing for madeleines myself. 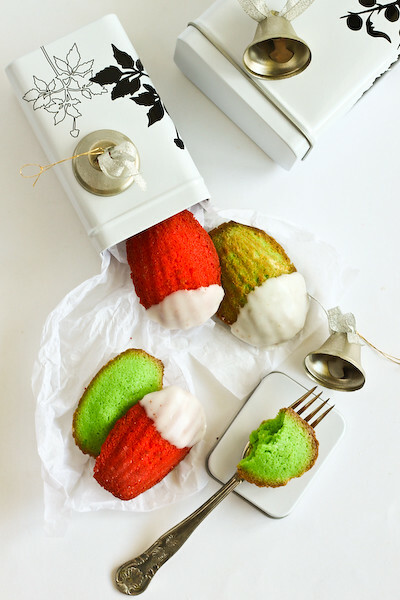 I love it that you've incorporated the pan dan element into your Madeleine and the colours are so festive!